A short ( one day) exploration of self-reflection and physiognomy. 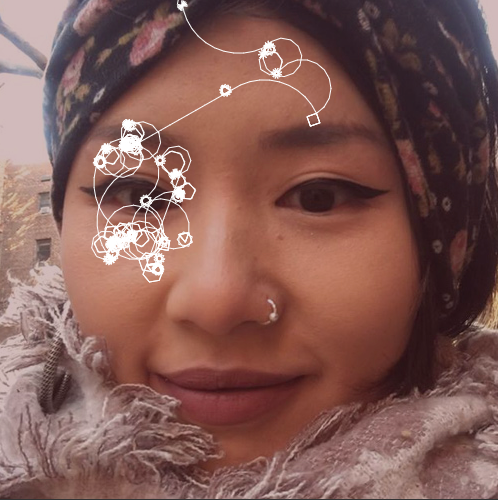 Using p5.js I made a code-driven face reading/divination program in which I upload a photo then run the program, which draws an expressive, looping, line over the querent’s portrait. Based on the point of origin, location, and density of the line I then interpret the image. The system for interpretation is loosely based on a mix of Celtic and Chinese (xiang mian) symbology and represents the dominant forces in the subjects life at the moment of calculation. It’s not an attempt to predict the future or comment on the person’s appearance. Rather, it functions as a sort of mirror and, ideally, prompts the querent to consider what the described influences mean to them. I’m fascinated by systems that engage intuition and the goal is personal reflection more than prediction. Often we already possess the information we need to solve problems. We just need help knowing where to look. Where is the line concentrated? How dense/sparse is the line? Eyes: Degree of focus, perception. Emphasize on one eye indicates awareness is something particularly. Lines spread across both eyes suggest a broad awareness. Nose: Sensuality (nostrils) and pride (bridge). Ears: Openness and receptivity to new ideas. Pay attention to the constellations, where the line clusters into nodes. Density of clusters indicate intensity and concentration of that particular region. Straight lines connecting nodes indicate a strong relationship between those concepts. Curving or wandering lines suggest a softer relationship between two connected nodes. This project is largely about the personal nature of interpretation, leveraging our tendency to find patterns and meaning in random action or input. Its up to the viewer to find or dismiss meaning and the system itself doesn’t provide answers, predictions or concrete interpretations. I love the openness of systems that rely on users to express themselves. 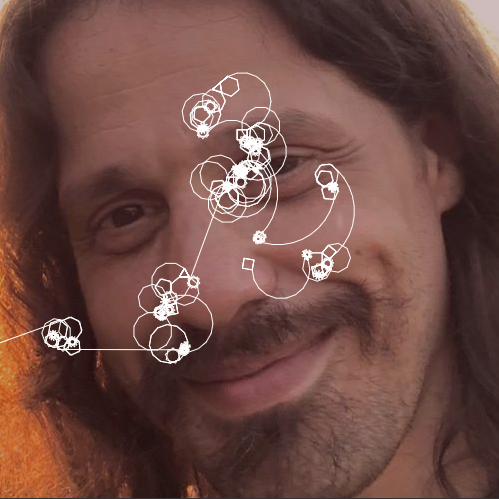 That said, a potential next step for this project might involve making the code aware of the source image and, using AI, generate evaluations about the person in the photo based on the structure of their face, ethnicity, etc. While I haven’t coded anything that does this I know it can be done and many of the systems for facial evaluation are readily available so creating the ruleset should be relatively easy. At least broadly. It’d be fascinating to see how quickly nuance becomes a factor. How quickly generalizations fall apart. This would likely be problematic on a many levels - programmatically, ethically, etc - which would be the point. It would be an acknowledgement of dark side of physiognomy and that we’re only at the tip of the iceberg with machine learning. So version two of this project might be about the dehumanization and limitations of code-driven decision making. Every day we’re being sized up and sold to by algorithms and AI but what generalizations are being made in the interest of quick decisions and easy money? 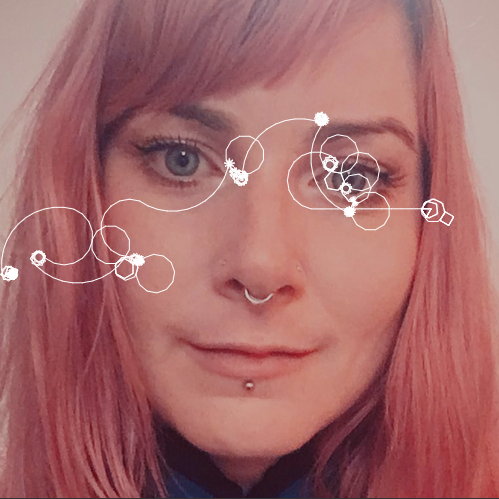 How are developer biases expressed through AI? How are we being dehumanized through the act of emphasizing and codifying the outward characteristics of our humanity? Eventually both pieces could be shown side by side: one that expresses the hope and creativity. And one that imposes biases. It would be interesting to see which of the two users most trusted and produce some documentation about how personal reflection and external evaluation are similar or different. How closely does our self concept match or differ from an external evaluation of the same criteria? Given a choice, do people trust their own evaluation or a computers?